A hotel receptionist who was apprehended for allegedly stealing from a Europe-based man in Benin city, Edo state and impregnating the daughter of the woman who was accommodating him has confessed to the crime. The suspect was said to have stolen from the hotel guest just one week after his employment at the hotel. He was reported to have targeted the man who just arrived from Europe and lodged at the hotel. It was gathered that the suspect entered the man’s room when he was not around and stole his laptop, iPads, phones and also 1000 Euro before he fled and told the hotel manager that he has quit his job as a receptionist. When the Europe based man came back and found out that his properties have been stolen, he notified the police who tracked down the suspect and arrested him. After his arrest, the suspect who was imprisoned in 2011 for robbery and cultism, claimed he wanted to return the stolen items before he was arrested. 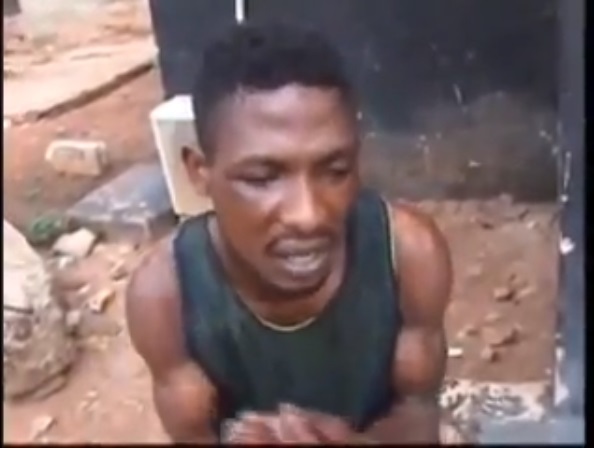 He said that he’s an orphan and the madam that accommodated him chased him out of the house after he impregnated her 17-year-old daughter. The suspect said he couldn’t resist sleeping with the girl due to the “green light” she gave him as he took advantage of the situation and had s-x with her multiple times. The teenage girl later got pregnant and her mother forced her to abort it. The suspect was later asked to leave the house. The suspect who is currently in police custody made some confessions and would be charged to court as soon as investigations are concluded.